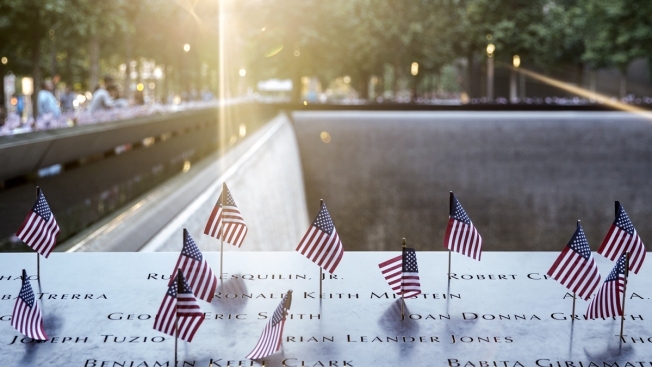 This July 4, 2018, file photo shows American flags placed in the names on the 9/11 Memorial in Manhattan. The $7 billion 9/11 Victims Compensation Fund is running out of money, its administrator said Wednesday. NBC News reported that the fund's special master, Rupa Bhattacharyya, said in a statement in the Federal Register that the funds "may be insufficient to compensate all claims." The fund expects to receive more than 6,500 claims on top of the 32,689 it had received by last year, Bhattacharyya said. Five New York lawmakers, including both senators, called this week for more congressional funding to the fund. More than 2,000 people are estimated to have died from illnesses linked to the response to the Sept. 11 attacks. The Zadroga Act set aside $7.3 billion to compensate the victims and relatives of the dead.